WordPress Central Station's Video Tutorials - A Must Have for WordPress Beginners! So you would like to get into the wonderful world of blogging but don’t know where to start? Unless you live under a rock WordPress is the preferred blogging software of the world. If you have technical knowledge it’s quite easy to get up and running with your very own WordPress blog. However, if you lack technical knowledge WordPress can be very intimidating and confusing. Luckily, WordPress Central Station’s Video Tutorialswill make the task as easy as can be. WordPress Central Stationoffers over 75 video tutorials spread across 7 training modules and has been perfectly catered to those who would like to enter blog world but don’t have the knowledge or understanding on how to get started. If all the information contained in these video tutorials were to be written out it could easily be over 1,000 pages long. At a price of only $47 it’s definitely worth the investment and a great bargain. Even better the first 3 days of service is only $5. If you’re not satisfied, WordPress Central Station will refund your money in full for a period of up to 60 days. If you’ve been looking to get into the world of blogging, these video tutorials will put you on the fast track to getting started, for only $47. Of course you could not pay the $47 and continue to aimlessly try to find the information you need but personally my time is worth way more than a measly $47 and I dare to say that you feel the same. So if you want to start blogging using WordPress like the millions across the globe, including yours truly, check out WordPress Central Station’s Video Tutorials and pay your $5 to get started. You’ll be happy that you did and join the thousands of WordPress Central Station’ssatisfied customers. 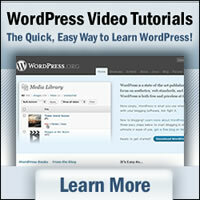 WordPress Central Station's Video Tutorials - Only $47!